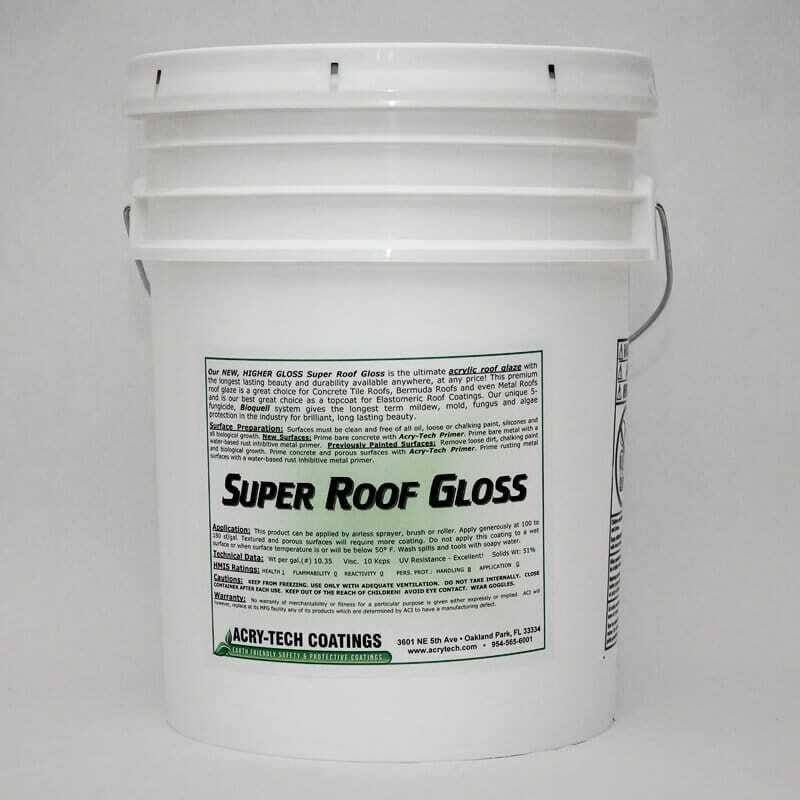 Super Roof Gloss is the ultimate acrylic roof glaze with the longest lasting gloss sheen beauty and durability available anywhere, at any price! 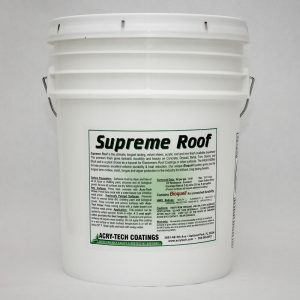 This premium roof glaze is a great choice for Concrete Tile Roofs, Bermuda Roofs and even Metal Roofs and is our best great choice as a topcoat for Elastomeric Roof Coatings. Our unique 5-fungicide, Bioquell™ system gives you the longest term mildew, mold, fungus and algae protection in the industry for brilliant, long lasting beauty. 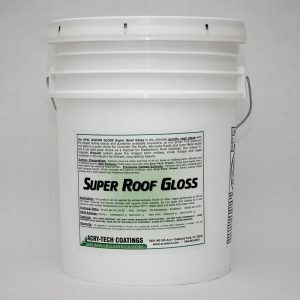 Super Roof Gloss is a proven winner for Concrete Tile Roofs, Bermuda Roofs, Elastomeric Coated Metal or waterproofed Shingle Roofs. 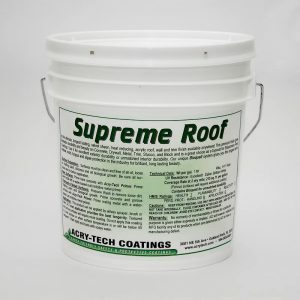 The glossy finish of Super Roof Gloss helps repel dirt pickup while its flexibility allows your roof to contract during the heat and cool of each day without chipping and flaking. The tough, durable finish lasts for years and years – much longer than home store brand roof paints. As a matter of fact it is the highest performing roof paint in South Florida. The special Acrylic Resin System binds the bright white titanium dioxide pigment into a tough, durable matrix while it is enhanced with our Bioquell™ Biocide System to fight mold, mildew, fungus and algae. The micro sized molecules of the Bioquell are time released to provide years of biological stain resistance. 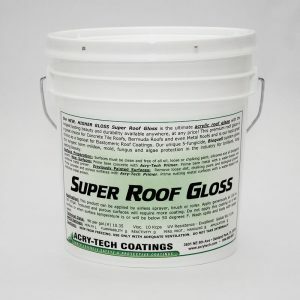 Super Roof Gloss applies easily, bonds tenaciously to roof substrates and performs for years longer than home store brands, saving you maintenance dollars. Surfaces must be clean and free of all oil, loose or chalking paint, silicones and all biological growth. New Surfaces: Prime bare concrete with Acry-Tech Primer. Prime bare metal with Acry-Tech Metal Primer. Previously Painted Surfaces: Remove loose dirt, chalking paint and biological growth. Prime concrete and porous surfaces with our AquaGuard Bonding Primer. Prime bare metal with a water based rust inhibitive metal primer. This product can be applied by airless sprayer, brush or roller at the rate of 100 sf per gallon to porous surfaces to 200 sf per gallon to waterproofed or metal surfaces. Textured surfaces will require more coating. Do not apply this coating to a wet surface or when surface temperature is or will be below 50°F. Wash spills and tools with soapy water.